Quick Questions in Heat-Related Illness and Hydration: Expert Advice in Sports Medicine provides a unique format of concise and to-the-point responses with clinical application, backed by the latest research on heat-related illnesses and hydration issues common among athletes. Dr. Rebecca M. Lopez and her contributors present 39 common clinical questions regarding topics such as how much and what kinds of fluids are optimal for performance and preventing illness, how to calculate an individual’s sweat rate, and the effect of supplements on hydration. Co-published with the National Athletic Trainers’ Association, Quick Questions in Heat-Related Illness and Hydration: Expert Advice in Sports Medicine provides concise answers to 39 frequently asked clinical questions. Written in a conversational tone, the authors of the individual questions represent a variety of different backgrounds and are experts in their respective field. The variety of questions and brevity of responses will make this a book that is easy to read and reference at the point of care. o Is it possible to prevent death from exertional heat stroke? o What temperature devices are valid when measuring internal body temperature in an exercising individual? o Does cold-water immersion cause shock or other adverse events? o What are the best methods of assessing environmental conditions and what modifications should be made to work to rest ratios, practices and games based on the environment? o What is the proper functional progression for an athlete returning to play following exertional heat stroke? o What are the most practical, valid methods of measuring hydration status in athletes? 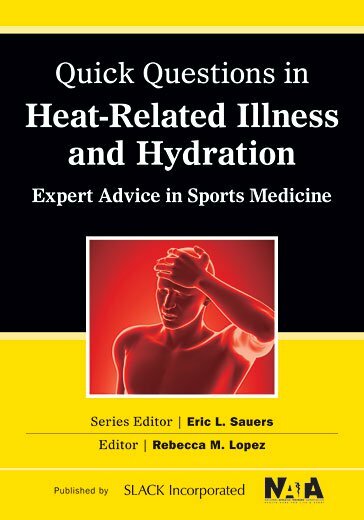 Quick Questions in Heat-Related Illness and Hydration: Expert Advice in Sports Medicine is the perfect at-your-side resource for the athletic trainer, team physician, or sports medicine clinician looking for practical answers to heat-related illness and hydration questions. The concise and conversational tone allows the reader to readily apply the information into their everyday practice. Question 2 What Factors Lead to Exertional Heat Stroke? Question 3 What Are the Physiological Benefits of Heat Acclimatization? Better Prepared When Exercising in a Warm Environment? Still an Issue in Athletic Participation? Question 6 What Causes Heat Cramps and How Can They Be Prevented? When Exercising in a Hot Environment? Can They Occur Independently of Each Other? Question 11 Is It Possible to Prevent Death From Exertional Heat Stroke? Question 12 What Criteria Are Used to Differentiate Between Heat Exhaustion and Exertional Heat Stroke? Internal Body Temperature in an Exercising Individual? Diagnose and Monitor a Possible Case of Exertional Heat Stroke? Question 16 How Does One Differentiate Between an Exertional Heat Illness and an Exertional Sickling Event? Athlete Has Exertional Heat Stroke? Question 23 Does Cold-Water Immersion Cause Shock or Other Adverse Events? Question 24 Can Exertional Heat Illnesses Occur in Cool or Cold Environments? Practices, and Games Based on the Environment? Returning to Play Following Exertional Heat Stroke? During, and After Exercise or Training? Replaced Before the Next Practice or Event? Replacing Fluid Losses Due to Exercise? Does This Help or Hinder the Athlete? Either Increased Performance or Preventing Exertional Heat Illness or Hyponatremia? Exertional Heat Illness During Activity in Hot Environments? Rebecca M. Lopez, PhD, ATC, CSCS graduated from Florida International University in 1998 with a Bachelor’s of Science in Health Education, Athletic Training Specialization. She returned to Florida International University and obtained her Master of Science in Advanced Athletic Training/Sports Medicine in 2004. She completed her PhD in Kinesiology from the University of Connecticut in 2010. Dr. Lopez is a Board-Certified Athletic Trainer, an American College of Sports Medicine Certified Health Fitness Specialist, and a Certified Strength and Conditioning Specialist through the National Strength and Conditioning Association. She worked as a certified athletic trainer in Miami-Dade Public Schools for several years and has volunteered in the medical tent at the Boston Marathon, Marine Corps Marathon, Falmouth Road Race, and others. Her research interests include exertional heat stroke and other exertional heat illnesses, cooling methods for hyperthermic athletes, ergogenic aids and thermoregulation, sickle cell trait in athletes, hydration and exercise performance, and preventing sudden death in sports. She has published numerous peer-reviewed articles and several chapters on exertional heat illness, hydration, and preventing sudden death in sports. Dr. Lopez is currently an Assistant Professor in the Department of Orthopaedics and Sports Medicine and the Director of the Post-Professional Graduate Athletic Training Program at the University of South Florida. She also serves on the medical and science advisory board for the Korey Stringer Institute.